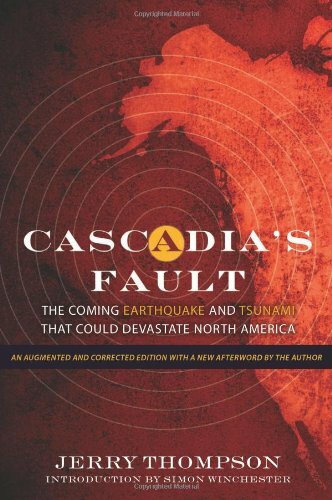 Cascadia’s Fault by Jerry Thompson acquaints readers with America’s earthquake and tsunami, which may devastate the Pacific Northwest sometime earlier or later in the twenty-first century. Moderate, strong, major, and great belong with the words which nobody likes to hear regarding earthquakes since they respectively describe magnitudes 6, 7, 8, and 9. Even a magnitude 6 can be disturbing, as in the case of the Parkfield area stretch of California’s San Andreas fault rupturing six times since 1857. But its devastation does not come anywhere near that of magnitudes 9.2 on March 27, 1964, in Alaska and 9.5 on May 22, 1960, in Chile. Some seismologists expect Cascadia to rupture catastrophically after three quiet centuries since 1700. The Cascadia Subduction Zone lies within the Pacific Ring of Fire. The Pacific Ring refers to volcanic arcs and oceanic trenches which partly encircle the Pacific. The Ring of Fire is a zone of frequent earthquakes and volcanic eruptions. Trenches are shown in blue-green. The volcanic island arcs, although not labelled, are parallel to, and always landward of, the trenches. The Pacific Ring of Fire of earthquakes, eruptions, and tsunamis from New Zealand, through Asia, to the Americas furnishes 15 of the 16 mega-earthquakes since 1900. The Ring generates cluster earthquakes, with the Pacific plate’s southeast, southwest, and northwest corners rupturing on February 27, 2010, February 22, 2011, and March 11, 2011. In the above-mentioned cases, the Peru-Chile Trench, the Izu Ogasawara, Japan, and Ryukyu Trenches, and the Kermadec Trench respectively huddle off Chile, New Zealand, and Japan. The trenches off these three countries and off Alaska, Indonesia, Mexico, New Guinea, Philippines, Siberia, and Tonga identify zones where sea plates move under land plates. From the Pacific plate’s northeast corner, Cascadia’s subduction zone joins the trench warfare. Cascadia’s fault line from Cape Mendocino in northern California, through Oregon and Washington, to Vancouver Island off British Columbia in western Canada keeps low geo-historical profiles. Cascadia’s 19 full margin ruptures of magnitude 9 and 22 partial margin ruptures of magnitude 8 in 10,000 years lead seismologists to rethink California’s upcoming mega-quake. Cascadia’s northern end from mid-Oregon to mid-Vancouver Island and southern end from Cape Mendocino to Newport, Oregon, manifest respectively recurrent intervals of 480 and 240 years. Dr. Kenji Satake of the Geological Survey of Japan and co-authors Kunihiko Shimazaki, Yoshinobi Tsuji, and Kazue Ueda note January 26, 1700, for Cascadia’s last mega-earthquake. They offer 21:00 local time based upon 10-hour tsunami travel times to Japan. Japan proves to be among the world’s most earthquake- and tsunami-prone countries because of offshore trenches and proximity to the Marianas, Philippine, and Siberian (Kuril) Trenches. Generations of earthquake and tsunami data-gatherers in Japan always question a natural disaster’s origins, particularly regarding orphan and phantom tsunamis independent of earthquakes in the archipelago. Entries from January 27 and 28, 1700, reveal 16-foot (4.88-meter) orphan tsunamis devastating 560-mile (901.23-kilometer) stretches from Kuwagasaki to Tsugaruishi, Kubota Crossing, Nakaminato, Miho, and Tanabe. Japan’s records serve to reinforce Huu-ay-aht, Makah, and Yurok oral histories from Pachena Bay and Columbia River, Copalis River, Grays Harbor, and Willapa Bay ghost-forest dendrochronology. Cascadia’s Fault takes readers on culturally enriching, educationally entertaining, and geo-historically enthralling adventures. The Earth's layer on which we live is broken into a dozen or so rigid slabs (called tectonic plates by geologists) which move relative to one another. Part of the Pacific Ring of Fire, the Cascade Volcanic Arc extends for a distance of over 700 miles (1,100 kilometers) from southwestern British Columbia through Washington and Oregon to Northern California. Subduction along Cascadia Subduction Zone is responsible for the arc's formation. The Cascadia Subduction Zone has generated massive earthquakes over and over again throughout geologic time--at least thirty-six major events in the last 10,000 years. This fault generates a monster earthquake about every 500 years. blackspanielgallery, Amen! Some seismologists describe an alternating pattern between the eastern and western Pacific Rim and suggest that the North American side is overdue for an earthquake since the Asian side had the Fukushima quake. At any plate boundary there is concern. Some earthquakes generate tsunamis, but others do not. his is because f the direction of the movement of the earth, how does the plate itself move. A plate that has vertical movement is more likely to form a tsunami than a plate that moves laterally.